Enjoy family games together with games like Soccer. 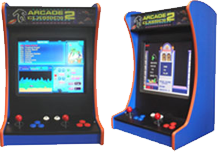 These games are not just for Arcade Centres but now you can own them for your Home games room or Man Cave. Bartop or Bench placeable arcade machine. This Arcade console is small and light enough to be put away when not being used but powerful enough to play all the old retro games that you’re used to. Fitted with 60 games. 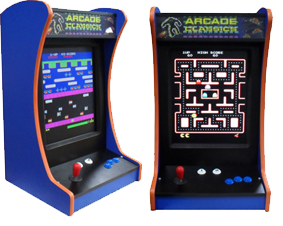 Bartop or Bench placeable arcade machine with East West Games. This Arcade console is small and light enough to be put away when not being used but powerful enough to play all the old retro games that you’re used to. Fitted with 600 games. Home Table Top (Cocktail Table). This is a home version of the favorite Arcade Cocktail table. Share the fun of playing this style at home. Home Soccer Table complete with Electronic Scoring. This ever popular Home soccer table has become a classic over the years. Unit incorporates home scoring to add to the excitement of the game.